The clicking of the hazard lights was interrupted by the whoosh of a passing vehicle. I sat in a small car on the side of a country road, listening to the sounds and making a mental observation; the sound of a passing car is different when the surface is wet. It’s just a trivial observation that drifts me into deep thought and I remember growing up as a US Military B.R.A.T.. My first memories are of 16B Oak Street on Maxwell Air Force Base in Montgomery, Alabama. Being stationed there, my father would come in contact with officers from air forces around the world. I still remember many of the names to this day. I remember because a specific group of officers became family friends. My family is from Portugal and when the Portuguese Officers arrived at Maxwell, they sought out the only “jaboke” in the Heart of Dixie that spoke their language. When an officer returned home, he would pass on the address to the next officer and like clockwork, they came knocking. 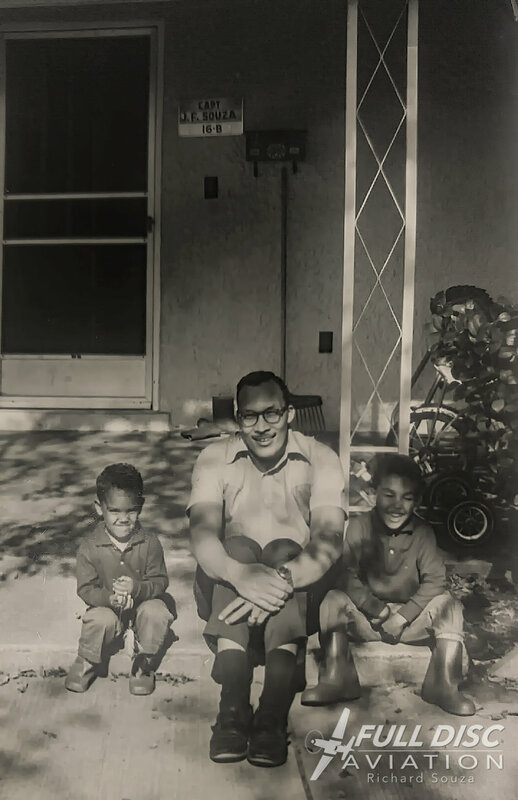 It should be no surprise that when Pops ended his career, we moved to the "Old Country". I did not know it thirty plus years ago but the seed to this story had been planted. Since becoming part of Full Disc Aviation, I felt the seed germinating. Every year, when I travelled back home, the plant kept growing. Every plant needs to be watered so I broke out the hose and fed the garden. Eventually, this plant gave its first fruit. Full Disc Aviation was granted access to an air base of the Portuguese Air Force. It was a autumn morning and while I hoped for the best, the weather didn’t seem to want to cooperate. Since I had people waiting for me, I would walk through a thousand puddles before I turned back. The first step was to check in with base security, after that it would be like Christmas day… a gift waiting to be unwrapped. I looked out the windshield and noticed a thousand droplets obscuring my view. Whooomp!! The sound of the wiper blades woke me from my momentary day dream. With a clear windshield, I saw a uniquely painted Cessna T-37C Gate Guard. This plane on a stick still seemed to want to soar high. Feet from the aging “Tweety Bird” was a small narrow access road. On one side of the road was a barn and the other a chapel. As I passed the church and barn, the claustrophobic feeling dissipated when the road opened up into a parking lot. I had arrived at Base Aérea N. 1 da Força Aérea Portuguesa or Air Base 1 of the Portuguese Air Force, BA1 for short. As you can tell, I am not in Kansas. Before I go any further, it is important to point out that my name is Richard, not Ricardo and the Portuguese Air Force is called Força Aérea Portuguesa or F.A.P. Some things shouldn’t be translated. Base security instructed me to drive to the HQ. The face I made told the astute Airman that more information was needed to compute. The Airman gesticulated the direction and with a few extra words, I thought I could make it without creating an international incident. When I arrived, I was greeted at the door by Capitão (Captain) Pedro Reis. After the introductions, we walked into the building and I was taken to the command conference room. There, we were joined by two Junior Officers, Alferes (Second Lieutenant) Vasco Lampreia and Bruno Dias. Over an espresso, the gift began to be unwrapped and grand tour was about to begin. It wasn’t by chance or whim that the visit began in this majestic conference room. 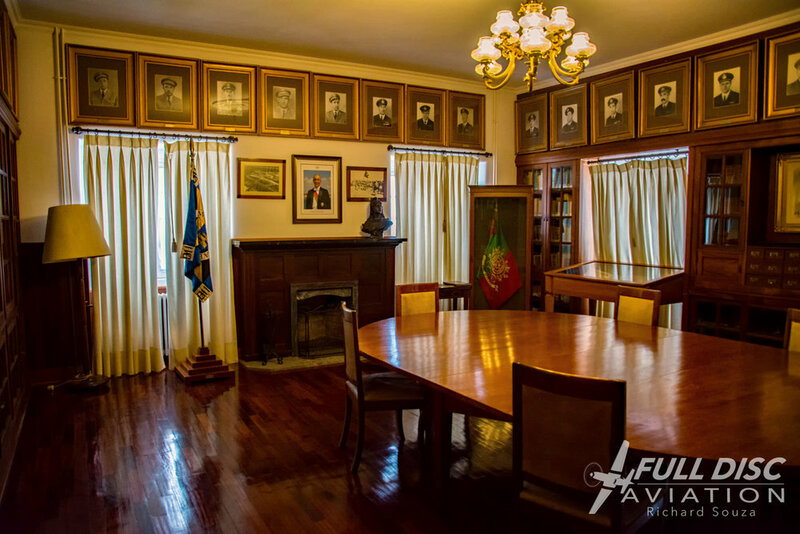 As I looked around the room, from the furniture to the book cases, from the base guidon to the portrait photographs of every base commander since it opened in 1920, it all embodied the history and traditions of the Força Aérea Portuguesa. After our introductions, we put down our espresso cups and walked around the room. The young officers began, what would turn out to be, a two hour history lesson. While most “Avgeeks” would be want to see hardware and things that fly fast, I understood that history lives here. The hardware can wait. These young officers had my undivided attention. BA1 can basically be broken down into four parts. 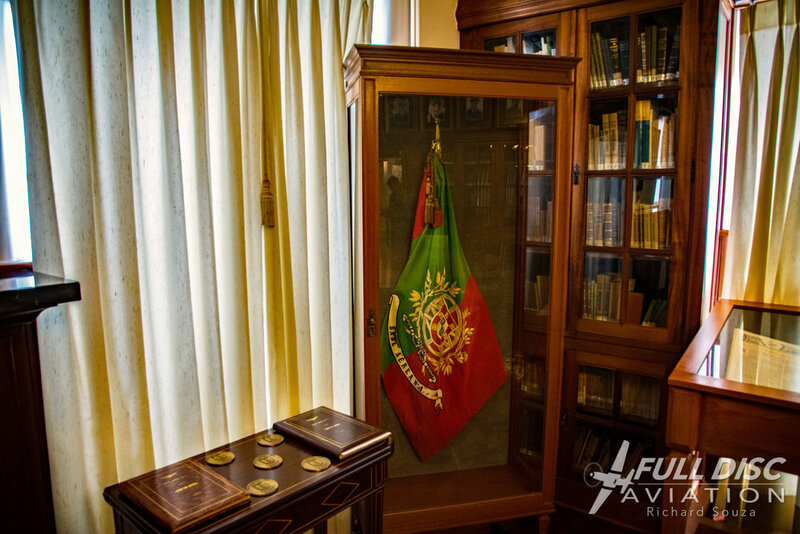 The historic section, the Museu do Ar (Portuguese Air Museum), the flight operations and the Academia da Força Aérea (Portuguese Air Force Academy). While the academy is located on base property, it acts as an independent unit and its entrance is separate from that of the rest of the base. Unfortunately, our visit was not to include the academy. A fine mist continued to fall from the sky as we left the HQ. This made photography a challenge to say the least. Cap. Reis raised his arm and pointed to the Serra de Sintra (Sintra Mountain) and was apologetic for the weather not cooperating. This base is known for its unobstructed view of the mountain, the palace and ancient castle walls that sit atop. I assured the young officers that I would not let that dampen my enthusiasm. BA1 is located on farm land that has been inhabited since the Neolithic times. Archeological evidence points to a Roman and Arabic occupation. The land once belonged to the visionary Prime Minister Sebastião José de Carvalho e Melo, known in Portugal as Marquês de Pombal. The land adopted the name, Quinta da Granja do Marquês (Farm of the Marquis). The walls of these historic buildings tell a story that dates back to 1700. The old palace, which was once living quarters and stables is now the Officer's Club. The new palace houses some administrative services. The club pool is what used to be the reservoir that was fed by the still existing aqueduct. As I walked the grounds, I admired how these structures had been restored and how the antique seemed to blend seamlessly with the modern conveniences. Inside the palace, the sound of our steps interrupted the silence in the air. 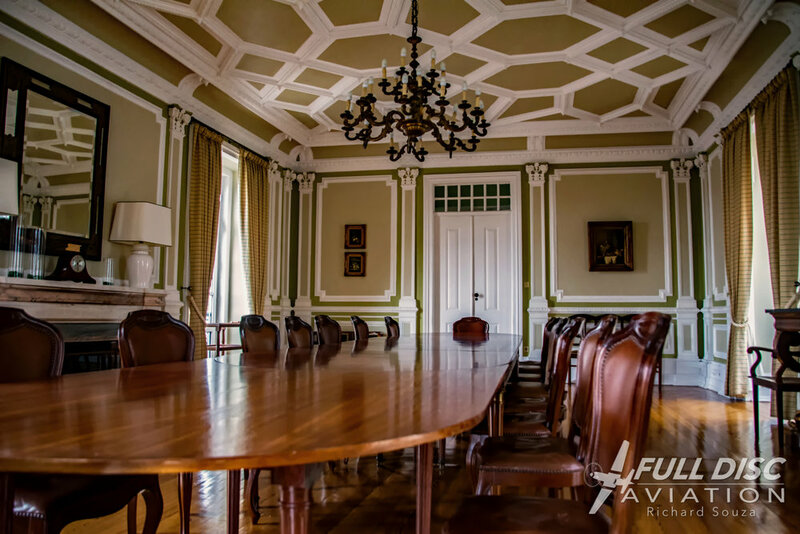 In order to preserve the building, many of the rooms of the Officer’s Club are now only used for special occasions. With a tilt back of the head, I could admire the craftsmanship of the crown molding; a true work of art. Walking through every room, my trusted guides provided the historical play by play commentary. If they were not pilots, I would have sworn they were historians. When we reached the last room, I looked toward the invisible Serra de Sintra, and imagined myself sitting at one of the tables outside watching the sunset. It must truly be an amazing view. Next to the palace is a chapel. The Capela da Nossa Senhora da Nazaré was complete in 1701. 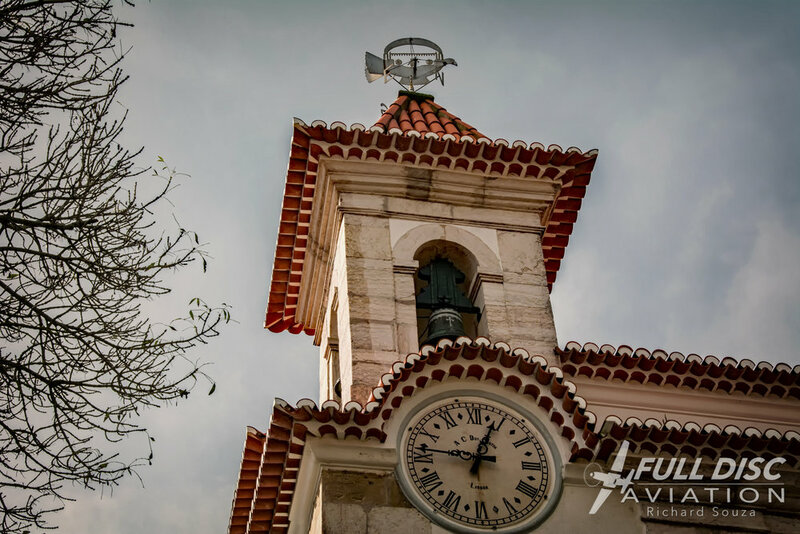 The chapel is dedicated to Nossa Senhora do Ar, or Our Lady of the Air, the Patroness of Aviators in Portugal. Cap. Reis pulled out the key and opened the door to the bell tower. We climbed up the narrow granite stairs to a clock chamber. There is something fascinating about the intricacies of clocks. 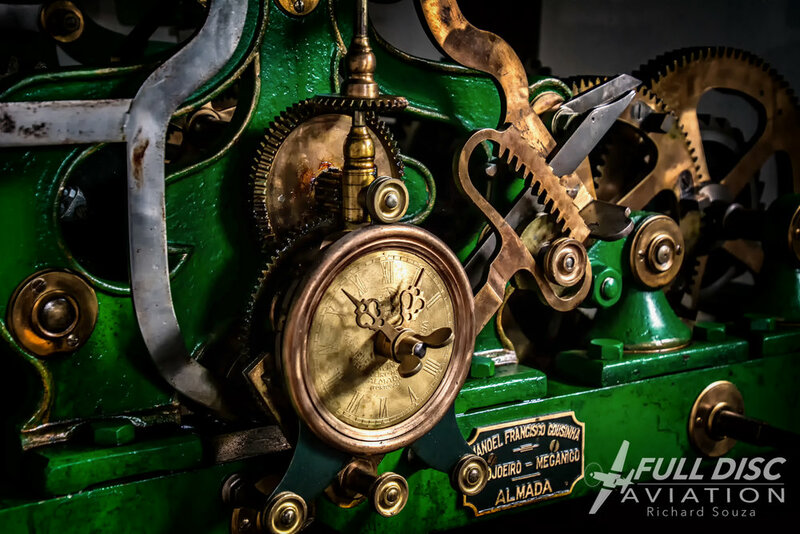 I was staring at a fully functional antique clock that is one of only two of its kind in Portugal. When asked if I knew where the other one was, I responded, the archway of the Praça do Comércio in downtown Lisboa. The chapel is still active and regular Sunday services are held there. The service is open to the public and a group of locals often attend. The echo of the opening door resonated inside the chapel. Quiet and serene, I hesitated before I photographed. When I got the nod that it was ok, I took a few shots. I am a believer that churches shouldn’t be photographed, they need to be seen. This little corner of the base is quintessential Portugal. It is a microcosm of what you will see throughout this country. Older buildings are tastefully adapted to modern use without losing their aged charm. There are many buildings in many towns that look like this… that is the beauty of this country. Looking up at the clock on the tower, we could see that big hand was on Roman numeral I and the little hand on Roman numeral XII. Cap. Reis motioned that we needed to mosey on to the mess hall, there were people waiting for us. As we walked toward the mess, my mind began fast forwarding back to the present year. At the mess hall, a group of officers had already gathered outside. Before breaking bread, Cap. Reis introduced me to everyone. Seated at the table, I was humbled that they took interest in my life, my work and this project that we call Full Disc Aviation. It just reinforces my belief that aviation is a universal language and passion is something everyone present had in common. They exchanged a few stories and experiences which showed the more personal side of the FAP. If you judge a meal by the company you keep, then… I just had a gourmet meal. Normally after a good meal and good company, I like to sit back and relax, but there was no rest for the weary. It was time to get back on schedule. My guides pointed in the direction of the control tower and Cap. Reis shifted his mental gears and went from historical lecture to base operations in a flash. On the way, we stopped and visited the monument that is dedicated to all the fallen aviators. Anytime I see a monument like this, I always pay my respects. 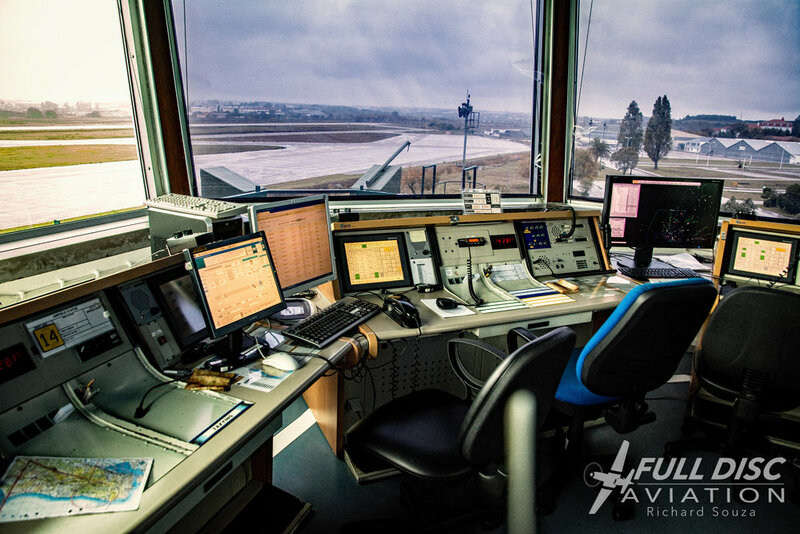 When it comes to having an office with a view, nothing can beat the control tower at BA1. The base is situated 440 feet above sea level. 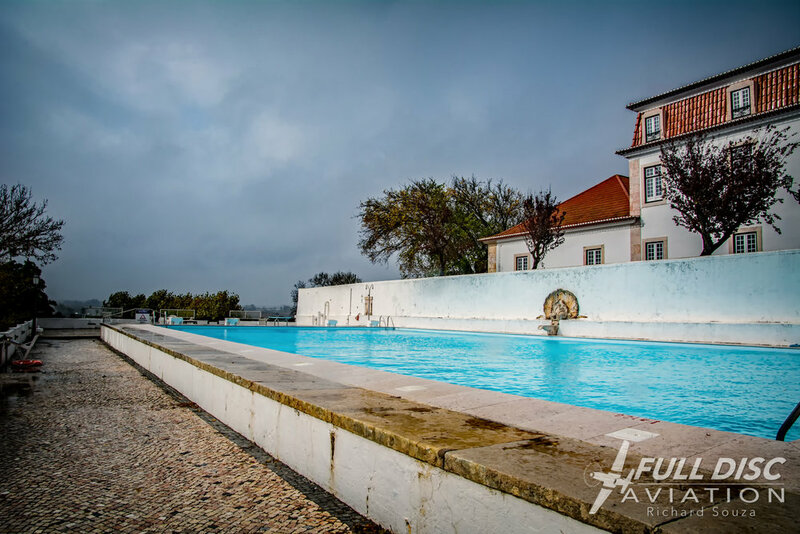 The tower, being one of the highest structures, has an incredible panoramic view of the Serra de Sintra. The first stop inside was meteorology. 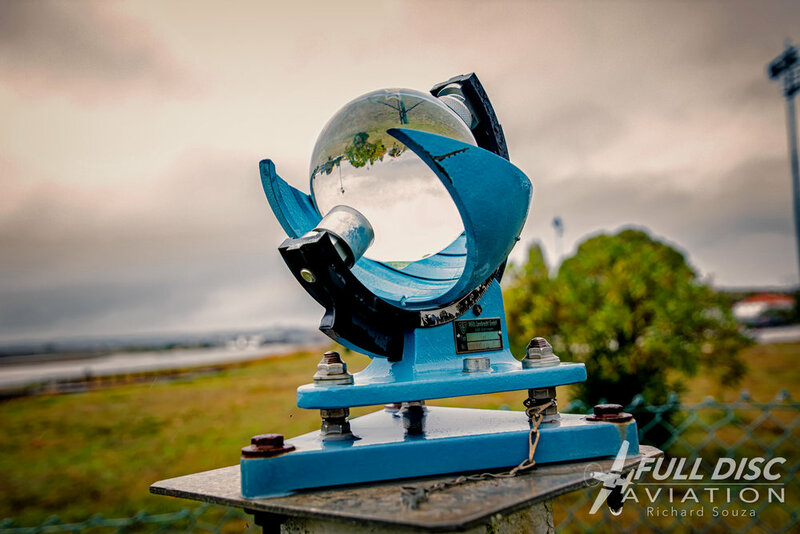 There I was given an explanation of their day to day activities and how they are responsible for feeding meteorological data to the air force meteorological center. 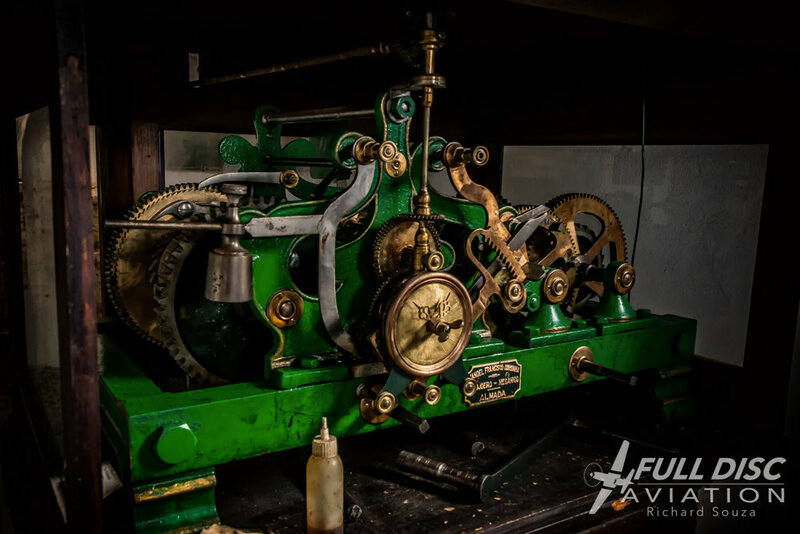 What caught my eye was not the modern sophisticated systems they use, but the fact that time proven classic old school equipment is on hand. 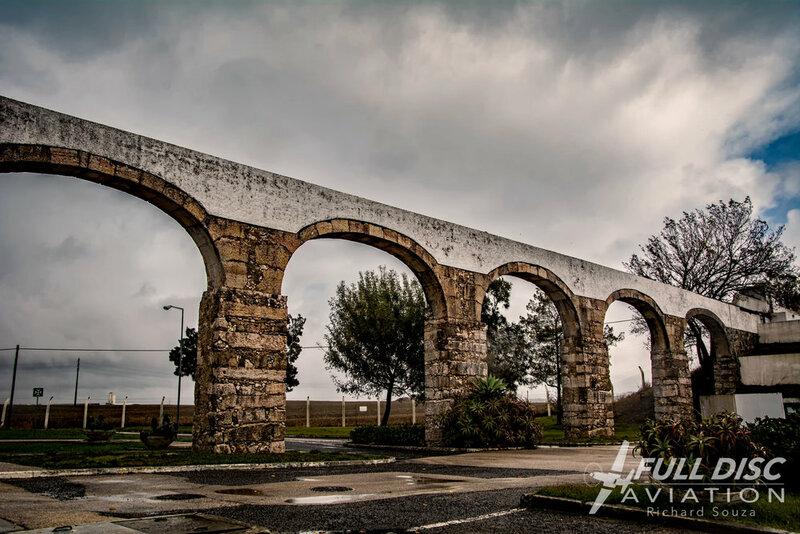 An example were photographs of the Serra de Sintra with markers at certain visual levels. If all else fails, look out the window and match the cloud cover with the marker on the photo and you will have your ceiling height. The FAP keeps it simple and keeps it real. Taking the stairs to the top floor, we reached a closed door. We rang the doorbell and were buzzed in. Instead of walking in, I had to climb a ladder to reach the tower. We are greeted by Sargento-Ajudante (Senior Master Sergeant) José Rocha. Like a well-rehearsed choreography, Cap. Reis steps aside and without missing a beat, Sargento Rocha begins to brief me on the tower operations of BA1. After a slight pause, Sargento Rocha points to a button on the console and informs me that in the event of an attack they hit that button. What does it do? I asked. In a very serious tone Sargento Rocha responds, missiles are immediately launched… then he smiles… “Just kidding”. That is what I get for taking myself so seriously. As I walked out onto the tower balcony, I saw some white buildings toward the back of the base. While I thought I knew what it was, I asked if that was the academy. My suspicions were confirmed. That was the Academia da Força Aérea Portuguesa (Portuguese Air Force Academy). Believe it or not, that place means something to me. Papa Zulu, AKA my Father, was an English instructor there for some years. It is one of those things that connects me to the FAP. 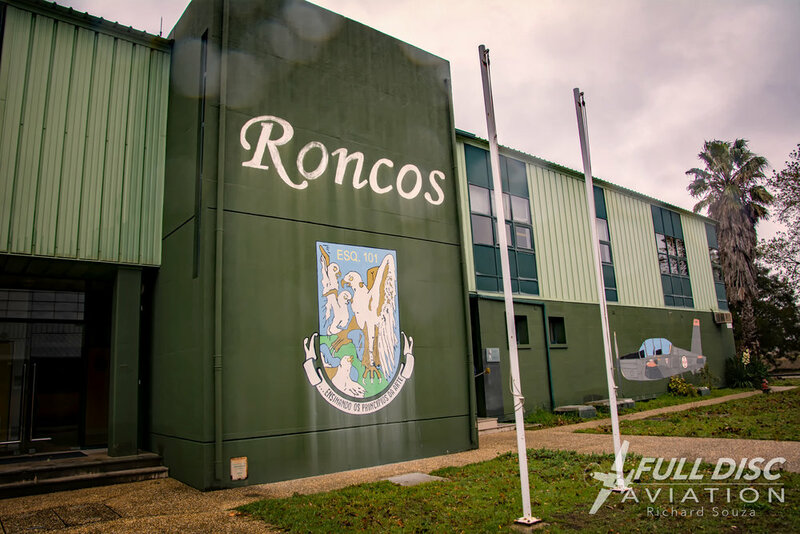 Just a stone’s throw away from the tower is the building that is home to Esquadra 101 or “Roncos”. This is the primary flight training squadron. Cap. Reis is an instructor and Alf. Lampreia and Dias had recently completed their flight training and are waiting for slots for advanced training. You will probably hate me for this, but I’m going to hold off opening that door. I'll keep that story for a rainy day (wink, wink, nudge, nudge). Trust me… have I ever let you down? Running a bit behind schedule, Cap. Reis and Alf. Dias had to leave for a meeting. Alf. Lampreia and I made our way down the road in the direction of the academy hangar. The anticipation of seeing some Chipmunks put an additional pep in my step. As we reached a bend in the road, I saw a man standing by a van wearing some sort of orange reflector vest. He began to talk to Alf. Lampreia as if they knew each other. As we got closer, I noticed that this man had a bird on his arm. Wait… that wasn't just any bird… it's a falcon. It looked like I was in for a treat. The falcon breeding, training and handling is managed by a civilian company specialized in falconry. Mr. Rui Fortunato explained that BA1 is located along an avian migratory route. 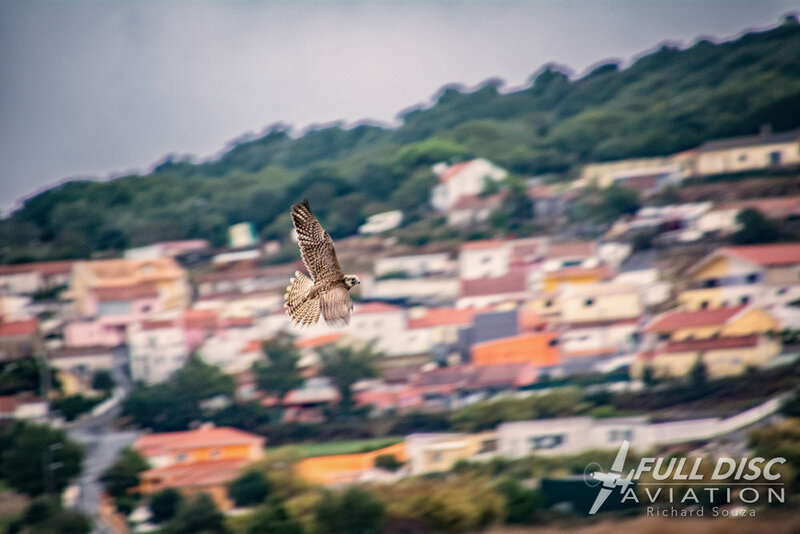 Because of the Serra de Sintra and its proximity to the ocean, the birds divert inland into the base's airspace. To ensure the safety of air traffic, the base has to resort to falconry. We were standing outside of the structure where about a dozen falcons lived and bred. Mr. Fortunato removed the hood from the falcon and started to slowly walk into the tall grass. The falcon demonstration (of the feathered kind) was about to begin. With the gorgeous bird perched on his raised arm, the tether was released. The falcon took off like a bat out of hell and proceeded to fly, what appeared to be, aimlessly. The wings were flapping at such a ferocious rate that it made me ponder. It is actually easier to photograph Major John “Rain” Waters on a high speed pass (in his F-16 Falcon) than this falcon on a mission. After only a few minutes of flight, the falcon crashed to earth! Mr. Fortunato ran through the weeds toward the spot where the falcon came down. Things happened so fast that I had no idea what was going on. 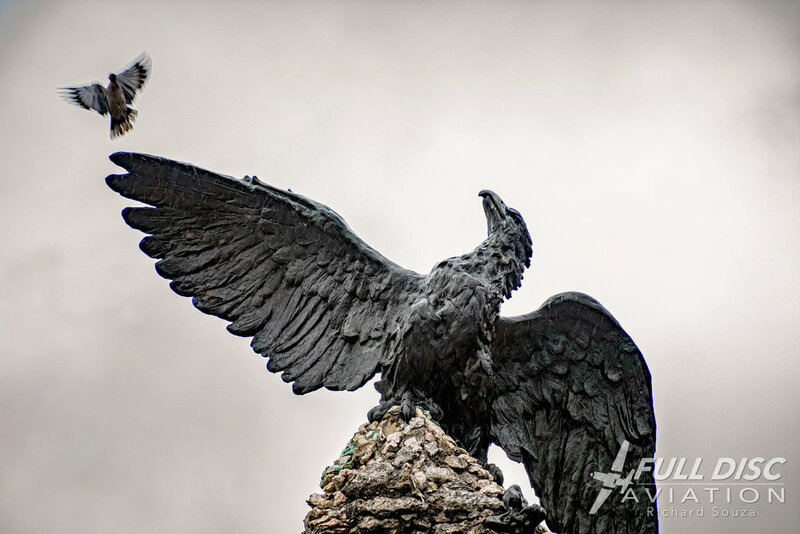 Seconds later, he emerged with the falcon on his arm and a wild duck in the other hand. The smile on Mr. Fortunato's face said it all. The falcon was gripping onto the protective glove with one talon and a piece of chicken in the other. A small treat for a job well done. “This never happens, the guys at the office will never believe me,” said Mr. Fortunato. Falcon demonstrations for visitors are not uncommon, but never have visitors seen a falcon catch prey. What was more impressive was that this falcon was only five weeks old and that was its first official “catch”. I say “catch” and not “kill” because the Mr. Fortunato was quick to explain that they try to get to the falcon before any damage is done. They want the prey alive. When they release a survivor, it will fly back to its compadres and say “stay away from that place, there are some really bad birds over there”. It’s a case where negative publicity is a good thing. Still amazed at what we just witnessed, Alf. Lampreia and I began the walk back to HQ. By this time the rain had taken a bit of a sabbatical but the low clouds still hid the mountain from the view. This walk gave me a chance to chat on a personal level with the young officer about hopes and dreams, the FAP and aviation in general. There was one more stop to make before the day was over. It appeared the Base Commander wanted to meet me. As I entered the waiting area outside of the Commander’s office, the door opened. A cadre of officers exited. I recognize the faces, for they were whom I dined with or were my guides when I visited their corner of the base. One by one they gave me their best wishes and I thanked them. Standing at the door was young Cap. Reis who motioned me to enter and introduced me to Coronel (Colonel) Luis Manuel Nunes Serôdio. The Coronel told me a little about himself and his experience as an exchange flight instructor at Luke Air Force Base. I tried to assemble the words that would form the appropriate expression of thanks and gratitude to the Coronel and all the men and women at BA1 for such an amazing day. While the Força Aérea Portuguesa may be unknown to some, it isn’t to me. It has been an indirect part of my life since I was a child. I have seen this air force go from flying F-86 Sabres to the F-16 Fighting Falcon. I have seen the FAP evolve into a force that is now leading its NATO partners in missions around the world. BA1 was where it all began for the officers who came through our door at 16B Oak Street. It was here that they earned their wings. It was an honor to walk the same ground they walked a lifetime ago. All good things come to an end and this day had reached that point. Cap. Reis and Alf. Lampreia extended a hand and with smiles on their faces, they thanked me for coming out and visiting their corner of the world. And it was I who thanked them for being incredible hosts and guides. As I drove off down the narrow road, I stopped at the gate guard. I looked at the T-37C and thought about the first thing Cap. Reis told me over our cup of espresso earlier that morning. When he was eight, his teacher asked the class room if they could be a kite, what kind of kite would they be. Young Pedro Reis raised his hand and said, "I would be a kite of the Força Aérea Portuguesa flying at thirty-five thousand feet". May you keep flying high Capitão Reis. 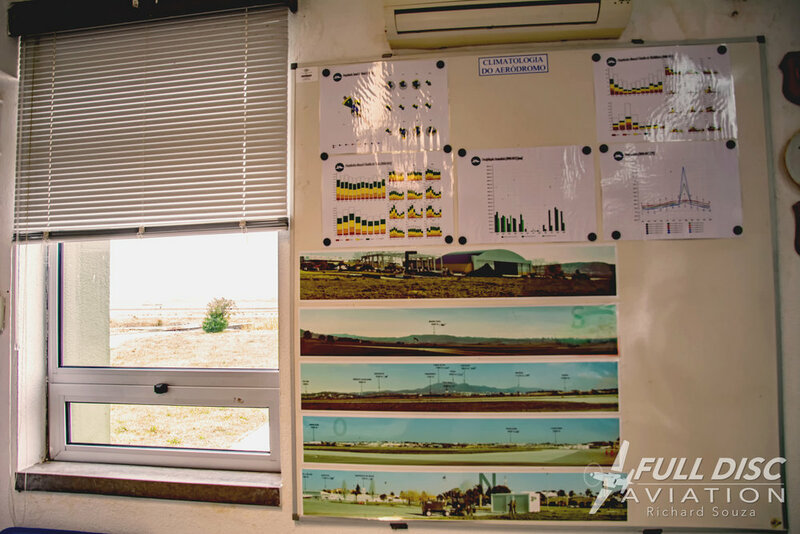 Full Disc Aviation wishes to Thank the Força Aérea Portuguesa, Coronel Luis Manuel Nunes Serôdio and the entire Command of Base Aerea N. 1 for making this story possible. I want to personally Thank Capitão Pedro Reis, Alferes Vasco Lampreia, Alferes Bruno Dias, Sargento-Ajudante José Rocha and Senhor Rui Fortunato for your hospitality and sharing your passion.